One of the sharpest "noses" ever. 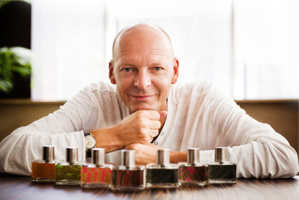 Author of fragrances for Givenchy, Versace, Paco Rabanne, Burberry, Salvador Dali, Cartier, Chopard, Ferre. One of the brilliant pages of his perfumer career concerns his companionship of many years with Comme des Garcons. Mark's personal testament has always been "Simplicity is the ultimate degree of luxury". This credo is incarnated in his works as well as in his life. Mark has various interests apart from perfumery: English painting, antiques and gastronomy. Nameless ~ "Sitting on a terrace at the lake of Come. Watching the boats sail in and out of the harbour, especially "Riva's"; wood and water." With notes of mandarin, cardamom, orange flower, lavender, cinnamon, coffee, clove, jasmine, amber, ciste, wood, guaiac, patchouli, cedarwood and benzoin. Wood & Absinth ~ "The contrast between 2 very different natural products : wormwood and vetiver like a love or hate relationship. If you find the right balance they are in perfect harmony." With notes of citrus, orange, clary sage, anise, jasmine, rosewood, wood and vetiver. Black Angel ~ "An English man in New York." With notes of citrus, bergamot, mandarin, orange, rosemary, ginger, cardamom, coriander, nutmeg, jasmine, lily of the valley, orris, styrax, guaiac and patchouli. English Breakfast ~ "It's 7 in the morning. An English man in Japan sitting in the Shinkansen is going to Kyoto. What does he do at this time? He opens his sushi/sashimi box for breakfast." With notes of bergamot, orange, pepper, ginger, coriander, geranium, galbanum, calendula, jasmine, rosewood, gardenia, patchouli, vetiver, labdanum, fir, cedarwood and benzoin. Sounds & Visions ~ "Dancing in a cedar forest on a warm and sunny day!" With notes of bergamot, mandarin, pepper, ginger, cardamom, nutmeg, rose, jasmine, rosewood, patchouli, guaiac, cedarwood and sandalwood. Hot Leather and/or Around Midnight sound most appealing to me even though I really don't like Paris, 2bh. I'll substitute Paris for Berlin in my mind. I really like MB's work & look forward to trying these…but hope the notes are correct other than the one obvious error. Lots of them sound so similar that I hope they didn't make cut & paste mistakes (something I do frequently). I'm a bit puzzled by Nameless. 'Lake of Come'?? He must mean 'Como' surely? That sounds like something from Etat Libre d'Orange. I assume they meant Lake Como too. I think they need to do a wee bit of editing on the website. Not like I'm throwing stones, mind you. Well, since I am crazy about Comme ded Garcons, I'll have to try this one too. I'd love to try the English Breakfest very much! Do you think these will ever be available at Luckyscent? I really want to try all of them. Ouarzazate is my current pepper scent, so I really really want to try Hot Leather. And also I like the idea of hot pink leather. But Nameless has some of my favorite notes and is also the one that the color thing on the site recommended. So I definitely need to try both of those. But either Around Midnight or Hot Leather is wrong. Hopefully Around Midnight because it doesn't excite me as much. What does that nutcase woman on TV say?!? — “I die! I die! !” These sound yummy. They should at minimum be interesting. As always I wish there were fewer of them. I will be very surprised if one of the niche retailers in the US doesn't pick up the line. But then, I've been surprised before. Gosh, they'd better be interesting. So so so agree on the number. I don't understand why niche lines feel the need to start off with a full line-up, esp. given the glut of scents on the market at the moment. Wish they'd started off with 2 really great perfumes. A new scent from Marc Buxton is always reason to celebrate, in my opinion. Really admire MB's work, so have high hopes for this line. I don't put much stock in the list of ingredients; the proof's invariably in the pudding. do understand coming out with more than one or two scents if they're not compromised in terms of quality; with personal tastes so varied, “really great” is largely subjective, and with a wider choice, I have more chance of finding a scent that smells really great to ME. In terms of really great scents, I don't find that there is a glut of them on the market at all. What we're faced with is a glut of poorly-conceived scents and a dearth of quality and originality. So bring on the Mark Buxtons and let's have fewer mediocre celeb scents and flankers; let's be realistic about what the real problem is. A few minutes in front of the computer! With notes of interest, amusement, and a raised eyebrow. These mostly sound really interesting (can't wait to sniff English Breakfast; what a weird description!) but I'm not looking at anything I think I can't live without. The copy, though! I thought less is more. Maybe it's the fact that my top-most comment is used for at least four that makes it so funny to me. What's a day without amusing copy, though. At least I wasn't rolling my eyes like I do with some (You know who I'm talking to, Elixirs Charnel.) and it doesn't take away from the actual information at all. Lake of “Côme” is the French word for Como, no louche wordplay here… The website is clearly Russian (all the shop addresses are Russia, as is the e-mail contact address), which would possibly explain some of the linguistic weirdness. I find the idea of a line by Mark Buxton rather exciting. I hope it'll make it to France some time soon. Thanks, CC – just shows what a difference an accent can make! I wonder why it's so Russia-slanted? Does sound thrilling though. MB02/03 were the best of the Biehls for me. I know what you mean, you cynical girl, you. And you're right; it's just overload, truly. I guess that's why I can see a guy like Mark Buxton coming out with more than one or two scents in launching a line. He has a better chance of getting more presence in the marketplace if he hits the ground with a sizable range, producing a bigger bang, getting more shelf-space, garnering more press. . .or at least, I imagine, that's the strategy. Trouble is, with everyone doing it, we poor quivering perfumistas are left overwhelmed, confused, and resentful! It's the law of diminishing returns. It would have been hugely courageous and bold, wouldn't it have been, for Mark to launch just ONE?? Maybe he wanted to, and the money folks behind him insisted that he play the numbers game. . .an interesting subject in and of itself, R.
Adding my thanks, didn't know that. This ad copy is really pretty tame compared to some, you're right…and at least the descriptions are mostly short. Just a guess, but Russia is a huge market for niche right now (I spoke to MDCI's founder and he does his best business there) and the distributors (maybe even the backers) of Mark Buxton's brand could be Russian. Pardon my lack of experience-but they all sound masculine or unisex. Are they? And since I'm a floral-woody gal and the only unisex I wear and like is Bulgari Black, and the strongest I wear in small douses is D&G LB for him. Which one of Mark Buxton's do you think I might like, i.e., less strong traditional male? Becca, I have no idea, I haven't smelled any of them yet. Wouldn't it be interesting if these fragrance companies looked at the fragrance blogs as a direct source of feedback? Or are we too specialized/niche in nature to take seriously? I don't know — we're certainly not the perfume-buying public. Plus, looks like their target is Russia, so what you & I think probably doesn't matter anyway. I just laughed so hard that I cried for the blurb for English Breakfast. have you heard anything else about these? Thank you so much — I've fixed the article above.